One of the largest collections in the UK of ladies bangles in 925 sterling silver from Guilty, the independent specialist online bangle shop with an Exclusive range of solid silver bangles that are hand made and hallmarked in the UK. From the best selling plain round bangles to our superb cuffs, torques, view our silver bangle styles here. Our silver bangle range comes with free delivery for the UK and Ireland and all bangles come with a free silk lined and padded jewellery box that is designed specifically for bangles. This Sterling Silver Torque Bangle is one of our best selling ladies bangles, a favourite! A fairly new addition to our collection. The Bruna is an open cuff bangle with a great design, it looks fabulous on! A stunning chunky 925 sterling silver torque it looks fabulous on and is a popular piece of jewellery. Definitely one of our best selling cuff bangles. The stunning wide hammered torq, elegant and chic. Handmade in the UK, the Alexa is a chic, stylish solid silver bangle. A truly beautiful torq exclusive to Guilty Bangles. A contemporary twist on a torque style bangle, a beautiful crossover torque which will compliment your look. Enchanting sterling silver wavy torque bangle blending hammered and smooth textures, gorgeous! Gorgeous Alana Cuff Bangle. We adore the design of this wavy cuff that looks amazing on your wrist. Rounded hand hammered sterling silver ladies cuff bangle, simple and chic. 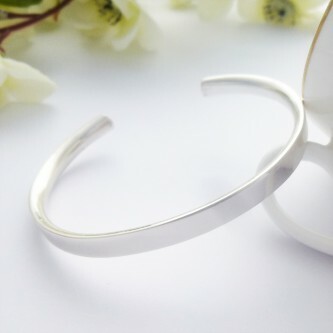 The Odessa silver ladies bangle, sleek, simple and elegant with open ends that provide flexibility. Solid chunky silver strands woven together to create a fabulous bangle! Beautiful solid silver ladies Torque with a stunning hammered effect! 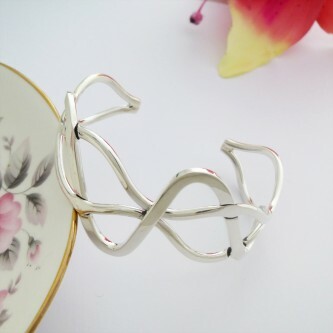 A beautiful and elegant sterling silver bangle in a stunning twist design. A perfect gift! 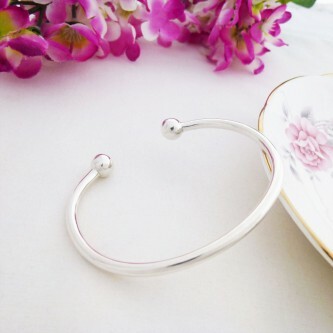 A pretty sterling silver torque bangle featuring a loop design creating a lovely bangle. Stylish sterling silver plain cuff, a classic design and a perfect present! Guilty Bangles is a leading supplier of a wide range of hand-picked sterling silver bangles, in a range that is designed to be elegant and exquisite. Our sterling silver bangle collection is our best-selling range and each piece has been chosen to offer a unique design for a variety of occasions, a perfect meaningful gift or to add to a sophisticated jewellery collection. We have a range of wide fitting silver bangles and chunky or narrow bangles to suit all wrist types, they are chosen to be comfortable to wear and also because the quality of the materials is regarded as the highest quality for the price. 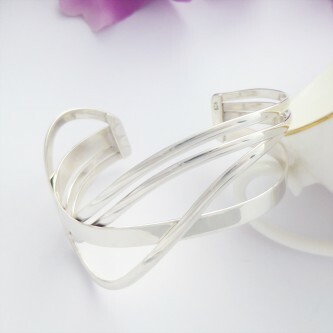 The designs have been chosen to offer flexibility and sophistication so that you can wear our beautiful wide or narrow fit silver bangles as day wear in comfort. The collection is also designed to offer a piece that would stand out in any outfit for an event, from a polo match to a black tie ball, these pieces are designed as contemporary modern, with sophistication, so that they can be worn by ladies of all ages. Our silver bangle collection appeals to a wide audience, from boyfriends and husbands buying a gift for their loved ones, to orders for bridesmaids and wedding gifts. A large proportion of our orders are for men buying a bangle as a gift and all of our products are delivered in bespoke boxes that are specifically designed for bangles and cuffs. 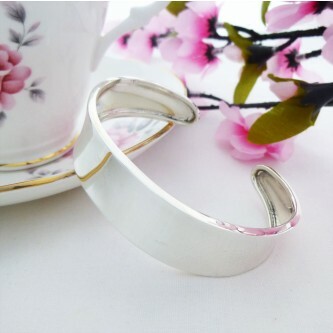 The outside is embossed with our brand name and inside there is a silk lined cushion that is designed so that the bangle sits perfectly inside so that it protects your bangle for the long term. 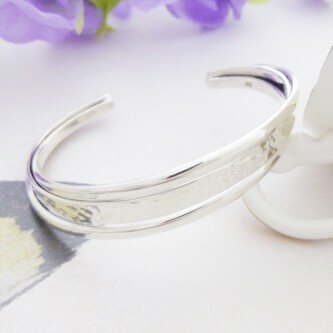 All of our sterling silver bangles come with free UK delivery, we always try to ship our orders fast so that you get them quickly and they always go so that they have to be signed for and are covered. If you need an order shipped fast and to arrive within two days, we can do that for you, please make a note if it is super urgent and we will try to ship the same day. Our prices are also designed to be competitive, even including the free shipping although for us, quality and service is the over riding factor. All of our silver bangles are hallmarked in the UK with a growing number available exclusively to us online and are UK manufactured to the highest possible quality standards. Free Guilty branded silk lined and padded box especially designed for bangles and cuffs.